Since its inception in 1911, the term “Eagle Scout” has been synonymous with the pinnacle of Scouting. It’s even found its way into the vernacular to mean “a straight-arrow and self-reliant man” (Merriam-Webster Online). More than two million Scouts—only 4% of overall Scout membership— have claimed the rank of Eagle Scout. Yet it’s the overwhelming vision and desire of nearly very Scout. ‎"An Eagle Scout is more than wearing a badge, it's a lifelong state of being. One never WAS an Eagle Scout. One IS an Eagle Scout." As a boy advances from the earliest stages of scouting, as a novice Boy Scout and then Tenderfoot, up through Second Class, First, Star and Life levels, he will be completing various advancement projects and working on merit badges. Encourage your son set aside a file to corral all those little bits of paper - advancement reports, blue badge cards - he may need later. Encourage him to start a list of activities - jot them in the back of the Scout handbook or add them to a computer file, anything's fine as long as he writes down every campout (location and number of nights), every service project, leadership position or badge. He will be profoundly grateful for that master list when binder time rolls around. Encourage your son to talk to his Scoutmaster about completing two or three Eagle-required badges a year. Merit Badges require Scoutmaster approval prior to beginning work on the badge. After meeting with his Scoutmaster / Troop Eagle Coach, your son should download the Eagle application booklet, and begin filling it out, paying close attention to the requirements. Get the recommendations component underway first. Begin considering Eagle projects, being careful to consider not only the national guidelines, but the particular quirks of his own troop and council. Encourage your son should meet with his Scoutmaster / troop's Eagle advancement advisor to discuss his thoughts and begin getting the necessary council approval for his project. Start the project, being careful to hang on to every document, and to record every hour and every phase. These elements are critical components of the binder. The Eagle project should be nearing completion. Your son should start writing up the project report, including a detailed breakdown of hours and tasks. Write the statement of purpose and ambition - a page-long essay - and the religious essay, if necessary. Start compiling the advancement record, personal data sheet and any additional paperwork for the binder. Your son should finish the binder, and meet with the Scoutmaster / troop Eagle advisor. Have your troop unit leader and committee chair sign off on the application and binder. Submit the binder to the council, and get that approval signed off. Schedule the Eagle board of review, which, unlike a normal advancement board, is held at the council, not troop level. Doublecheck every element of the Boy Scout uniform, from socks to kerchief slide, belt, regulation pants or shorts and shirt as well as the Merit Badge sash. Make sure all badges have been sewn on correctly (refer to BSA Insignia Guide). The Eagle board of review is not held at troop headquarters, so make sure your son gets the right address and figures out where it is well ahead of time to ensure that he arrives on time or - better - a few minutes early. Many parents attend with their sons to offer moral support. If you go, you will be expected to wait outside. Afterward, assuming all goes well, you will be congratulated along with your son. The review board typically consists of three council leaders. Your son's scoutmaster or unit committee chairman enters with your son and introduces him. Then the board asks questions, typically about your son's scouting experiences, his Eagle project, the things he enjoyed most about scouting and, sometimes, what aspects he would improve or what merit badge he'd like to see added. As intimidating as the whole thing may appear ahead of time, the actual experience tends to be a fairly comfortable chat, a chance to review and revel in everything that brought your son to this point. Your son should be polite, respectful and tactful. He should remember to express his thanks, both to the review board and his troop leaders. The date of a successful Eagle board of review is the date of the formal conferring of Eagle honors. The paperwork still goes on to national headquarters for review, but barring unforeseen circumstances, this should be a formality. Once the application has been approved at the national level, most troops start laying plans for the Court of Honor, a formal ceremony honoring the troop's newest Eagle scouts. Generally an Eagle COH is held separately from the Troop COH. Parents and the new Eagle should work with their Scoutmaster and Troop COH planners to cover details such as date & location, special guests and speakers and ensure the Eagle COH date is included on the Troop's calendar. The new Eagle should be encouraged to invite any leaders (past or present) that helped him along the path to Eagle. Also remember to send invites to any adults outside of the Scouting program (ie a favorite teacher, religious leader or coach) that had an impact on the Scout's life as well as primary contacts for the Eagle Project beneficiary. 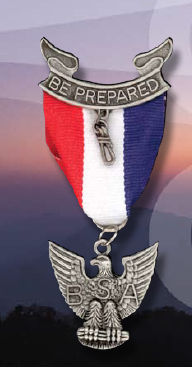 The Eagle COH is a GREAT way to share the highly regarded award of Eagle with those outside of the Scouting community. 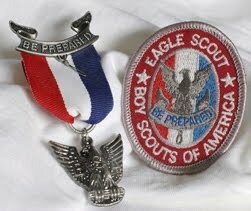 Parents should help the Eagle coordinate display items for the COH which cover his entire Scouting career as well as items showing the Eagle project. The above is a basic path to Eagle Scout. It is best to work with your Scoutmaster and your District Eagle Chair. NESA Members - The Gulf Stream Council hosts monthly NESA Luncheon's - check out the Council Website for details and registration! The National Eagle Scout Association! Don't wait, get your lifetime membership now! Monetary gifts from Eagle Court of Honors are a great way to pay for NESA memberships! Do you know about the NESA scholarships? - the Academic and the Merit. Under these two categories NESA awards thousands of dollars each year to selected applicants, the scholarships range from $1,000. to $50,000.! Get full details at the NESA website - www.nesa.org. For the more mature Eagle Scouts (i.e. - you earned your Eagle many moons ago! ), it is never too late to join NESA! 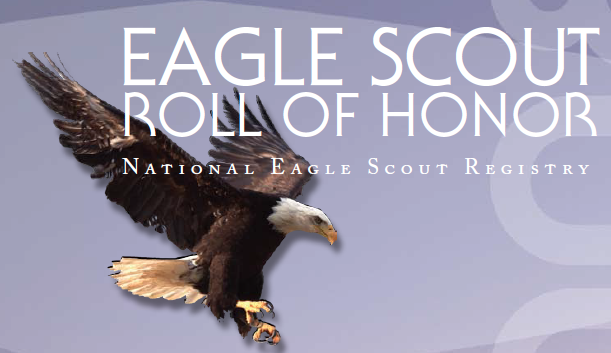 Find out about the NESA Eagle Scout registry and stay connected through this great resource! Check out the Gulf Stream Council Eagle Scout photo albums under the Tribute to Eagle Scouts tab!